A story in the Daily Mail about the resurgence of Sea Eagles in Scotland recently caught our eye as a reminder of now-abandoned attempts to re-introduce this magnificent raptor to our part of the world on the Suffolk coastline. The sea eagle, otherwise known as the white-tailed eagle, is one of the largest in the world and Europe's biggest bird of prey, the females having an impressive wingspan of up to 8 feet (2.5m). Their prey consists of fish, small mammals and they also scavenge carcasses. Hunted to extinction in Britain way back in 1916, successful re-introduction schemes were first initiated in 1975 and over 130 birds were returned to the wilds of West Scotland in the two ensuing decades. 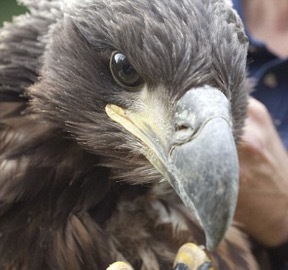 Since then further projects have taken place to expand this population, with over 80 juvenile sea eagles - legally collected from nests in Norway - being released along Scotland's east coast. Scottish Natural Heritage and Forestry Commission Scotland - supported by the R.S.P.B. - are behind the scheme and hope that the numbers will grow as the birds that have been released reached sexual maturity. As reported in The Telegraph at the time, the Natural England sponsored the idea to reintroduce the birds on the area of mixed heath, forest and farmland along the Suffolk coast known as the Sandlings, centring on the R.S.P.B. flagship reserve of Minsmere. However, this proved extremely unpopular with some of the region's farmers and landowners, who feared for the safety of their livestock and much to the disappointment of the Royal Society the decision to scrap it was taken. Our photographs are published with the permission of wildlife photographer Peter Cairns, who recorded the reintroduction of some of the sea eagles while taking part in the 2020Vision project - the most ambitious nature photography project ever staged in the UK. It aims to engage and enthuse a massive audience by using innovative visual media to convey the value of restoring our most important but often fragmented natural habitats - to show that healthy ecosystems are not just for wildlife, but are something fundamental to us all. Please visit their website for more about the project and some stunning wildlife images.